As they workforce for dentistry increases each year, the supply is gradually exceeding the demand. As of 2016, there are an estimated 196,441 dentists working in the U.S. alone, and this is not accounting for dentists in other countries. A prevalent marketing strategy in dentistry is offering free or discounted services. The problem is that it is not as beneficial as most people think. Most people actively track their ROI (Return Of Investment) for marketing purposes. This may seem like the best way to track it, but incentives may not be the best option. The use of discounts and freebies may result in loss, rather than profit. People who simply track the expenses are only seeing the tip of the iceberg. 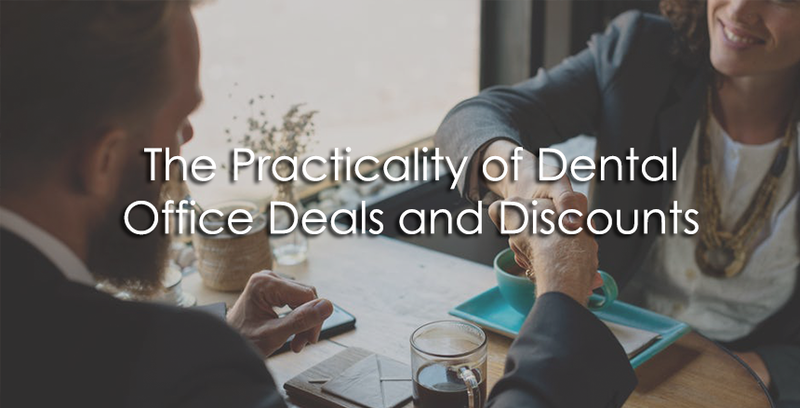 A recent study showed that the range of the average dental discount plan for non-insurance clients ranges from 10% to up to 60%. These include new client discounts, incentive discounts, and more. When a regular client finds out about the discount and brings along a friend for a service for the first time, this invokes two seperate discounts. If you look at it, you lose revenue rather than gain profit. ★ Track your patient/client population before and during a discount course. Analyze if the population between the two increases or decreases. ★ Setup a discount specific feedback or survey form, and possibly even a suggestion box. ★ Keep an eye on client referalls. This is what should determine if an incentive promo or discount is needed. ★ Assess the profit of dental plans and programs. You should be able to distinguish if a program is beneficial in the long term or not. ★ Evaluate each and every promo, discount and deal program. You should be able compare all the past, present and possible future incentives as to which are more practical and profitable than the others. In a consumer era of high standards , branding is what catches the eye. A strategically placed promotion can either make or break future profits. A promotion should not only draw in attention but also clearly send your marketing message. These setups will determine your reputation on the long run. A few dental practices even discount to a demographic’s standards of living. This means a lower class client can possibly have a bigger discount than a high class client. It all depends on how you tailor to a patient’s or client’s incentive. After assessing and planning your dental incentives, it is time to setup these into your dental services. This is the last crucial step and will determine the effectivity of it all. This is where you inform your marketing team so that they can advertise it properly. You must also notify your staff of the incentives to make sure you’re all on the same page. A properly expressed informative discount would more easily draw in a client. The confusion of mixed info might push them away instead. A well organized and properly briefed team could increase leads into appointments.